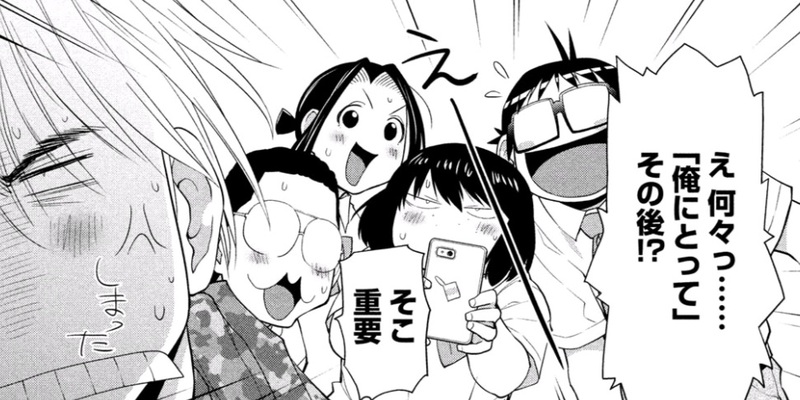 The Chorus Appreciation Society has its first big argument in Hashikko Ensemble, Chapter 14. With only one day to submit an application to enter the MHK Concours, the Chorus Appreciation Society is struggling to decide on a song for both practical and personal reasons. Among the considerations: available members, song familiarity, and taste. After a great deal of arguing and even a near-fight between Orihara Kousei and Hachida Shinji (! ), they finally land on a song they can all agree on: “Miagete Goran Yoru no Hoshi o” by Kyu Sakamoto. One of the practical considerations that the group has to account for is that any rewriting or adapting of compositions, for the sake of better matching the performers, has to be approved by the original creator. With less than 24 hours to decide, that means this option is out of the question. Kio didn’t have to place that limitation on his characters—he could’ve written the situation to have more leeway. 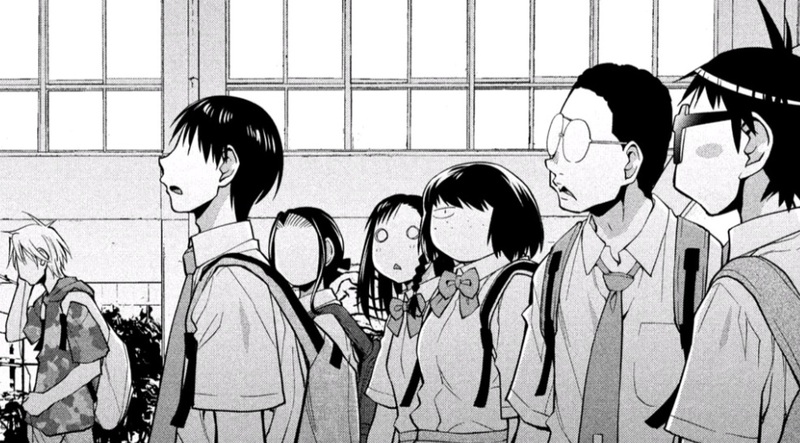 It does add a bit of tension, however, and it gives ample opportunity for the manga to go into detail about the typical statement of a chorus or ensemble. What is Normal? What is Otaku? One of the barriers is Kousei, who refuses to do any songs he considers embarrassing, which rules out all J-pop. Others are ease of performance and familiarity. Akira suggests they do a Studio Ghibli song, seeing how popular, well known, and tasteful they are. Hasegawa Kozue’s eyes light up at the prospect, but she’s shocked and appalled to discover that some of the members have never seen a Ghibli film—namely Jin and Kousei, though Jin has performed some of the songs. Shion also reveals that she’s never watched one, though Kozue is much gentler and more forgiving with her. This little interaction highlights a number of character aspects. First, the question of whether gruff judoka Kozue is actually an otaku is brought up by the other characters. There’s no clear answer, but at the very least, we know she’s not the kind of otaku to scoff at Miyazaki films. 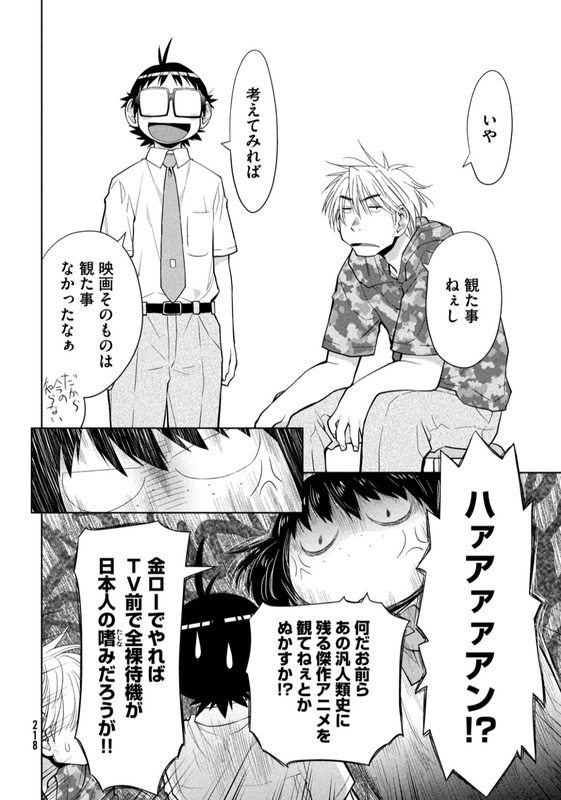 As for why those three in particular are Ghibli virgins, Jin and Shion can be attributed to strict households—Jin’s never even had TV. As for Kousei, it’s likely due to his traumatic, neglect-filled childhood. I find there are some similar trajectories for Kousei and Shion, in that both come across as hardasses at first but are softened up as they spend more time with the rest of the characters. The big difference is that while Shion just seems gruff but turns out to just be a goof, Kousei’s “lighter” side only comes out in tiny doses which are then exaggerated by everyone else. More broadly, there is a general theme of the Chorus Club/Appreciation Society helping people deal with or overcome their personal challenges. The title of the chapter, “Ore ni Totte” [To Me], actually comes from a line uttered by Kousei: “To me, singing’s…” Here, he’s expressing what may be some poetic or powerful view of music, and the other members try to eagerly egg him on to express what he means. It’s also telling that Kousei eventually says he wants to leave because it’s his tastes that are getting in the way, and that he’ll be fine with whatever—there’s a considerate person in there. However, Akira stops him because he wants a song everyone will be happy to work on. Both Kousei and Akira gain points in my eyes. As mentioned above, the song they pick is “Miagete Goran Yoru no Hoshi o” (Behold the Nighttime Stars) by Kyu Sakamoto. The way the characters described it as basically something everyone knows prompted me to do some research because I was unfamiliar with both the singer and the song. It turns out that Kyu Sakamoto is one of the most famous musicians ever, inside and outside of Japan. In 1963, he became the first Japanese performer to hit #1 on the US Billboard Top 100, and in 1985, he tragically died in the deadliest single plane crash in history. Other songs mentioned in the chapter include “Kanade” by Sukima Switch (of course), and the Ghibli songs brought up by Jin: “My Neighbor Totoro” and “Stroll” from My Neighbor Totoro, “Carrying You” from Laputa: Castle in the Sky, and “Country Roads” from Whisper of the Heart. 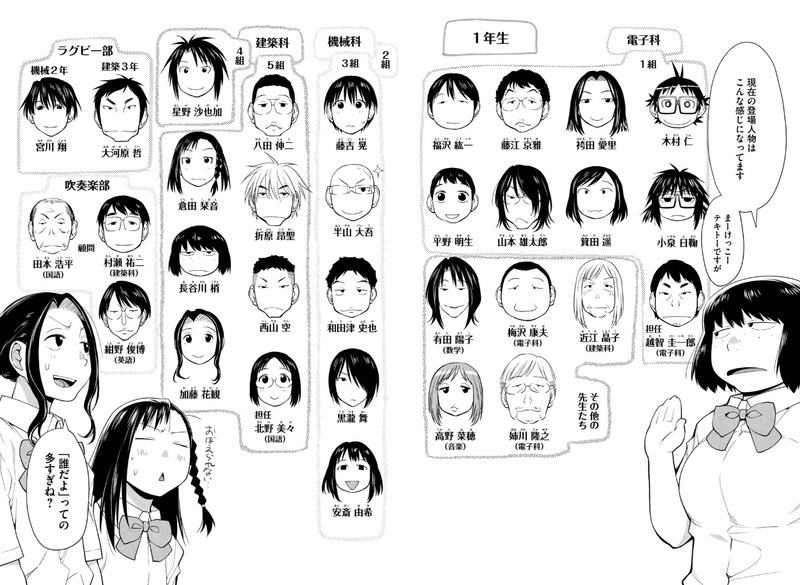 Kio actually made a chart showing all the characters who’ve appeared thus far with names and classes. It’s a lot! It also makes me wonder who we’ll see more of in the future, especially now that we know what to call every one of them. This entry was posted in anime and tagged episodic review, hashikko ensemble, kio shimoku. Bookmark the permalink.